From left to right are the Moon, Venus, and Jupiter, at 8:06 pm tonight, forming as straight a line as one could hope for. However they were not so close as last night, when all three bodies fit into a circle only 5 degrees apart; tonight about 8 degrees separated the Moon and Venus, and about 6 degrees lay between Venus and Jupiter. Last night all three could be seen at once, though barely, in the 9x63 binoculars; tonight I could not see any two of them in the aperture. 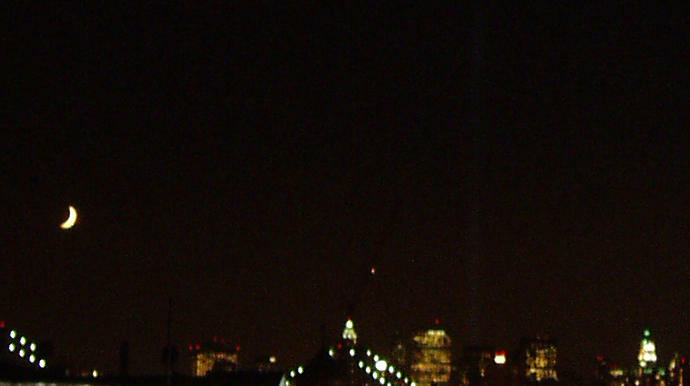 This shot at 8:27 is the only one I got which shows off the Tribute in Light, which began tonight -- look just to the right of Venus. Jupiter is nearly invisible and about to sink, as it did last night, behind the brilliantly lit spiral top of the Woolworth Building. It did so at 8:28, re-emerged at the other side of the spire two minutes later, and sank for good at 8:32. 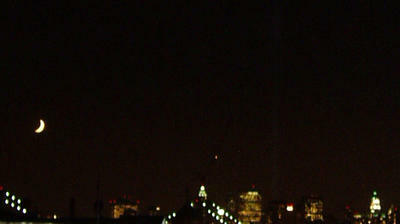 It hit the Woolworth three minutes earlier than last night, and in a slightly lower spot on the spire. 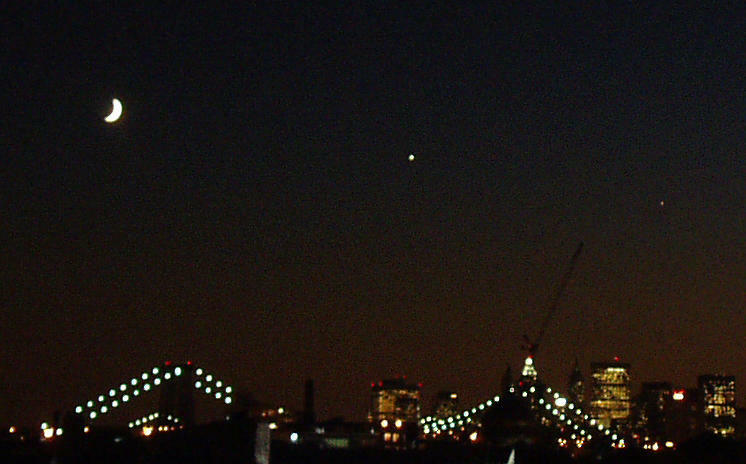 At 8:33 Venus disappeared behind the Chase Manhattan Bank, the wide box of a building in the middle of the above photo -- the one showing off more office lights than any other. Again Venus flashed blue when less than half of it remained uncovered by the building. When it re-emerged briefly to the right of the Chase Manhattan at 8:38, I did not notice a flash, though perhaps it was because my eyes did not know where the planet would re-appear. 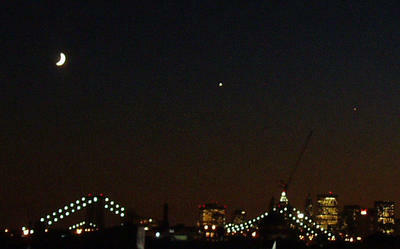 Within a minute Venus disappeared again, behind the next building over -- and another blue flash! I did not notice any flashing with either Jupiter or the Moon. 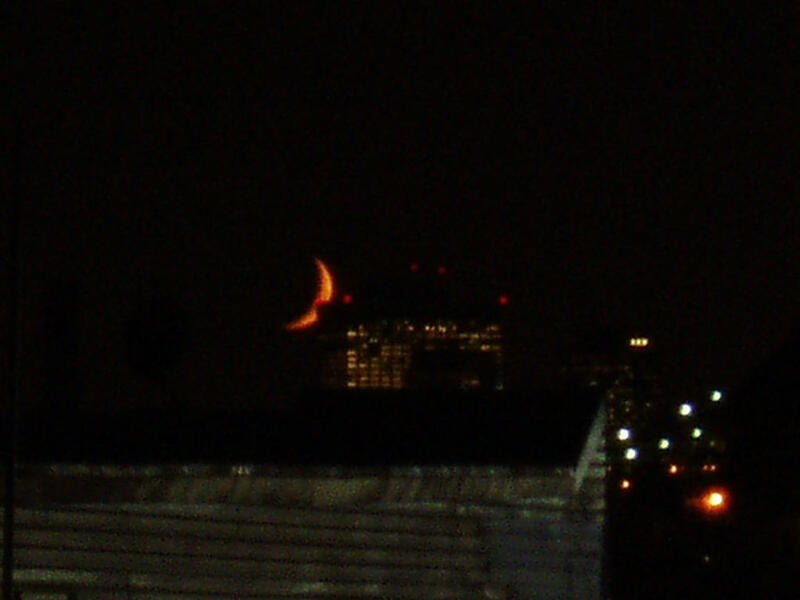 The moon at 8:45, seconds before it disappeared for the night behind 55 Water Street. The moon's face was 16% illuminated tonight. It's been four days since new moon, and in another four days the lunar face will be 50% illuminated -- a phase called first quarter, although I usually just call it "half-moon." I saw a few airplanes fly directly across the moon. One cut through the center, and when it emerged I saw an effect which astronomers sometimes look for in eclipses: when two bodies begin touching or separating, their light interacts like two blobs of water; it's called the "eyedrop" effect, akin to when the setting sun begins touching the ocean. To me it looked as if the airplane's engines were sucking some of the moon's white light, for just an instant, as they pulled away.